Reserved until April 14 ? The last reservation of this item will conclude on April 14. For rentals that require shipping or a pickup at a non-headquarter location, please select a later date for your arrival. Headquarter offices are the only locations that can accept a same-day reservation, as transit time is not calculated in this date. The last reservation of this item will conclude on April 28. For rentals that require shipping or a pickup at a non-headquarter location, please select a later date for your arrival. Headquarter offices are the only locations that can accept a same-day reservation, as transit time is not calculated in this date. 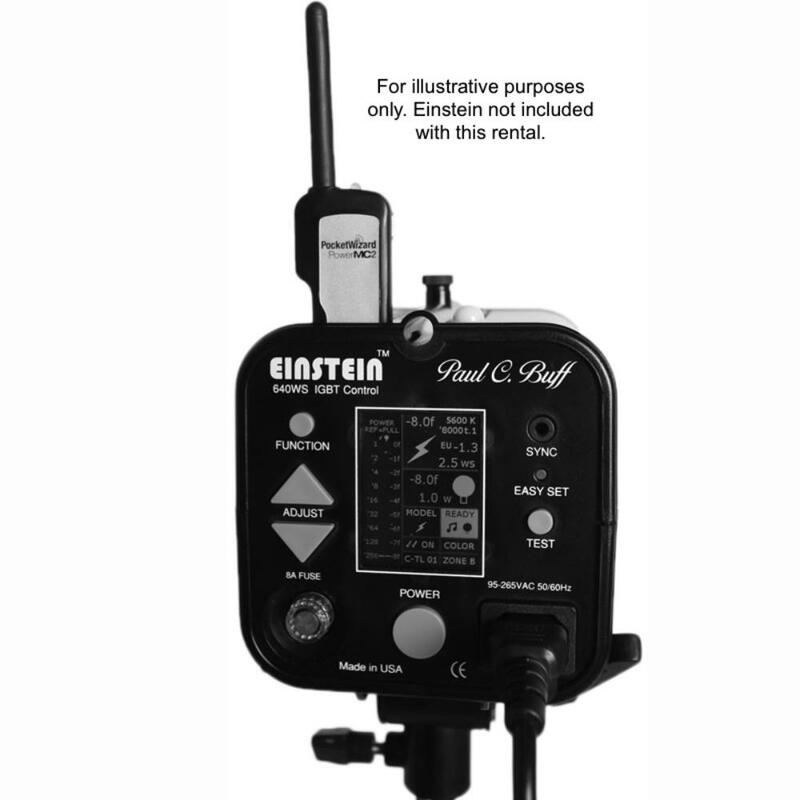 The PocketWizard PowerMC2 with ControlTL for Einstein E640 is a radio receiver specifically compatible with the Paul C Buff Einstein strobe. You will need to rent a separate PocketWizard of any variety to trigger the receiver from your camera. If you want to both trigger the MC2 and control flash power from your camera, you will need to rent either a TT5 for Canon or Nikon or a TT1 for Canon or Nikon in conjunction with the with the AC3 for Canon or Nikon. If you do not need to control flash power from your camera or if you are using a brand other than Canon or Nikon, then a regular PocketWizard, such as the Plus X or Plus III, on your camera's hot shoe will suffice. The MC2 features an automated HyperSync mode that will allow flash sync speeds up to 1/1250 seconds at full flash power. It is powered by the Einstein, so it does not need any batteries to operate. You can connect the MC2 to your computer with a USB cable (not included) and, with the use of the PocketWizard Utility software, you can pre-program the MC2 with preferred settings for your modeling lamp, power settings, HyperSync mode, and more. This receiver is ideal for wirelessly triggering an Einstein without having to have a standard PocketWizard dangling from the head via a sync cable.